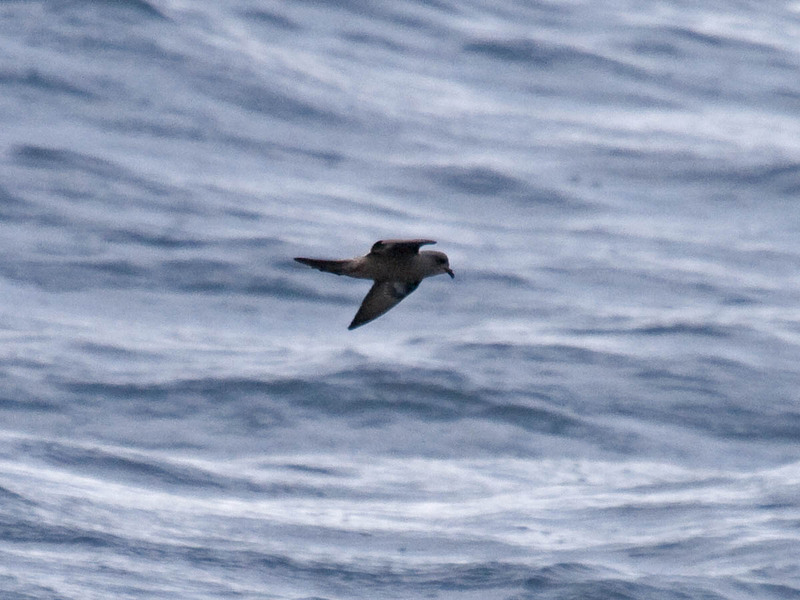 Ashy Storm-Petrel off Newport, Oregon. May 18, 2014. Greg Gillson. Note gray body, back, and rump, contrastingly darker tail and wings, and deeply forked tail. 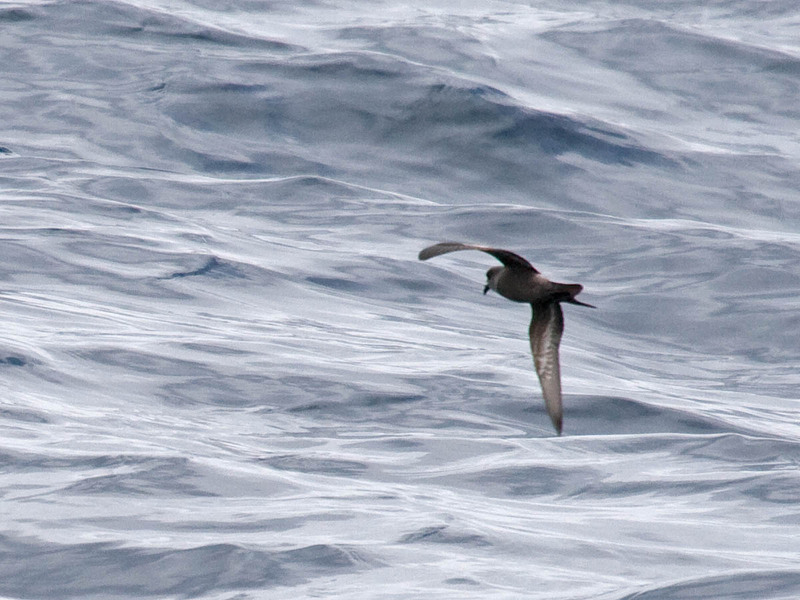 Prior to this photographed bird above there have been about 9 reports of Ashy Storm-Petrel from Oregon. Most have been seen from cruise ships about 50 miles offshore in spring and a couple in fall (the only times that cruise ships usually pass by Oregon). Because of the nature of cruise ships these sightings have been very brief and views relatively distant. Brief, distant views do not allow a chance for very thorough observation or photos, so it is no wonder that only two previous sightings were described well enough to be accepted by the Oregon Bird Records Committee. This bird, observed over a chum slick on a traditional pelagic trip on a 55-foot fishing boat 55 nautical miles W of Newport, Oregon, is the best documented Ashy Storm-Petrel seen in Oregon. Note the pale under wing linings and strongly forked tail. My notes: "extended views lasting about 12 minutes as fed on chum and fish oil slick around boat. 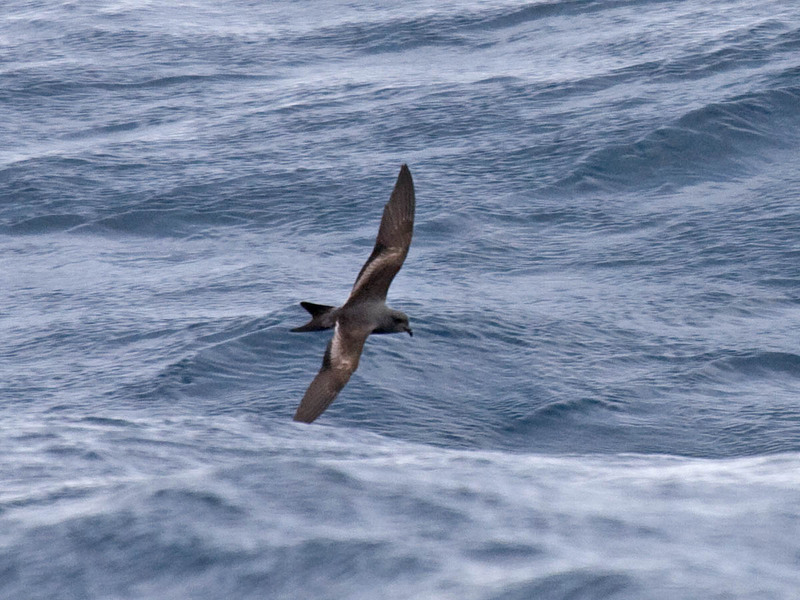 Gray bodied storm-petrel with black wings and deeply forked tail. Perhaps same length as Fork-tailed but thinner body and straighter, longer, thinner wings. Looked very long-tailed in flight. Pale carpal bar, pale under wing linings. Flight swooping, direct and twisting, shallow wing beats." Note how long the tail appears. 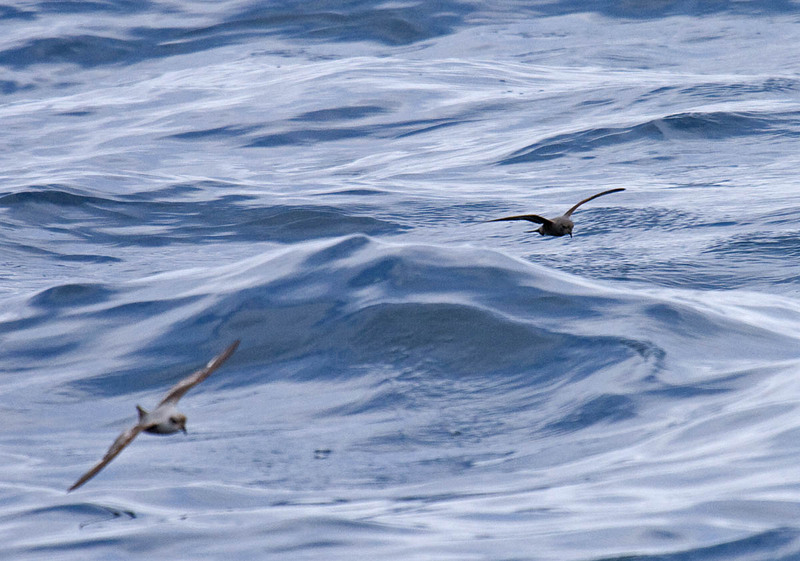 Ashy Storm-Petrel (right), Fork-tailed Storm-Petrel (left) off Newport, Oregon. There is no apparent wing molt. Pale carpal bar does not extend all the way to the leading edge of the wing. 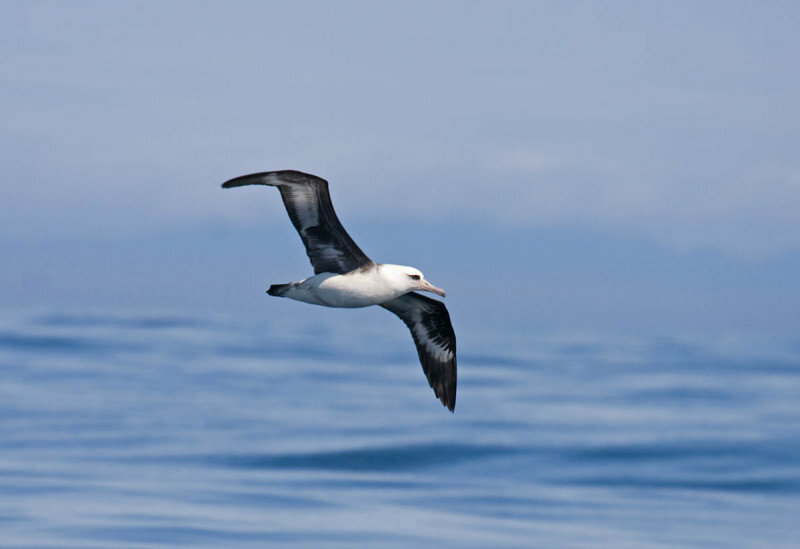 August 16, 2005: Seabird expert Peter Pyle reported a single bird 115 miles off Tillamook Co.
May 3, 2007: Schmidt, Gilligan, Wright, the Armstrongs saw 6 birds 45 miles off Coos Co. from a cruise ship. These were accepted by the OBRC as a first Oregon record. Two additional singles in Curry and Douglas by Schmidt were not accepted. May 8, 2009: Gilligan, Irons [edit: Dave Irons reports he was on this cruise but did not see an Ashy Storm-Petrel], Withgott, et al. spotted a "possible" Ashy from a cruise ship 60 miles off Clatsop Co.
July 14, 2009: The Armstrongs on a cruise ship reported 3 birds 70-100 miles off Curry and Coos Cos. The OBRC found the reports "compelling" but not quite complete enough to accept. August 31, 2009: Gilligan and Schmidt saw a total of 9 birds 55 miles off southern Oregon from a cruise ship. The OBRC accepted the written description of only 1 of the birds. So, what do we know? There have been several hundred traditional pelagic trips up to 35 miles offshore from Oregon throughout the year. This species has never been seen on upper shelf waters on a traditional pelagic trip. 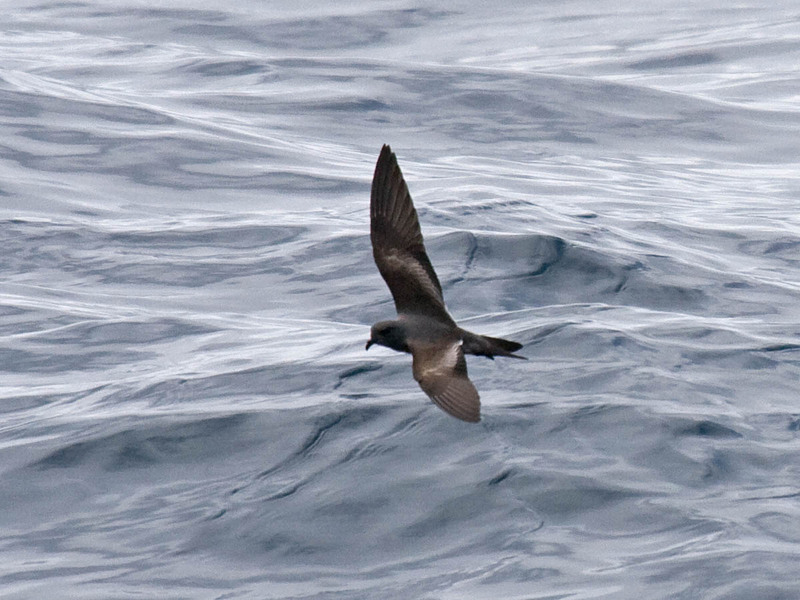 All sightings of Ashy Storm-Petrels in Oregon have been in deep water. It seems that the month of May is best. April and May are the times the cruise ships run repositioning trips offshore in spring. Most sightings have been off the two southernmost Oregon counties--Curry and Coos. This makes sense, as the species breeds in California. Laysan Albatrosses have been sighted with regularity on our late winter/early spring trips when we travel at least 25 miles offshore. Unfortunately, the last three years we have weathered-out--always a risk with Oregon pelagic trips, especially at this time of year. March 6, 2010: 2 LAYSAN ALBATROSS, 21 Black-footed Albatross, 2 Short-tailed Shearwater, 118 Black-legged Kittiwake, 8 Thayer's Gull, 33 Ancient Murrelet, 13 Rhinoceros Auklet. February 21, 2009: 1 LAYSAN ALBATROSS, 10 Black-footed Albatross, 1 Rock Sandpiper (jetty), 159 Black-legged Kittiwake, 50 Thayer's Gull, 2 Glaucous Gull, 26 Ancient Murrelet, 114 Rhinoceros Auklet, 1 HORNED PUFFIN. March 1, 2008: 8 LAYSAN ALBATROSS, 25 Black-footed Albatross, 1 MANX SHEARWATER, 1 Short-tailed Shearwater, 1 Rock Sandpiper (jetty), 40 Black-legged Kittiwake, 3 Thayer's Gull, 50 Rhinoceros Auklet. March 25, 2007: 1 LAYSAN ALBATROSS, 60 Black-footed Albatross, 2 Short-tailed Shearwater, 75 Black-legged Kittiwake, 2 Thayer's Gull, 500 Rhinoceros Auklet, 7 HORNED PUFFIN. March 18, 2006: 4 LAYSAN ALBATROSS, 60 Black-footed Albatross, 1 SHORT-TAILED ALBATROSS, 8 Short-tailed Shearwater, 90 Black-legged Kittiwake, 2 Thayer's Gull, 11 Rhinoceros Auklet.